An octopus has been filmed killing an unsuspecting seagull in Australia. The bird was seen looking for food on the ocean surface when the octopus spots its opportunity and grabs the bird with its tentacles from underneath. The poor bird can be seen flailing around in an effort to escape but unfortunately succumbs to the octopus and is left floating on the water. According to the Metro, the video was shot last year by Rowan Teece but it has just been uploaded to Reddit by a user called Urdok. When he uploaded the video to YouTube, Reece wrote: "I captured this rare event when we were feeding the seagulls hot chips down the Richmond River northern NSW. 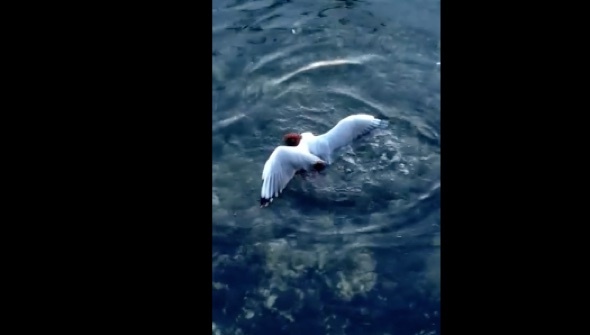 iIt grabed the seagull while it was swimming waiting for chips." A number of users commented that they were unimpressed with the video, and Rowan replied: "It is an act of nature why not look at how animals feed in our world , it is a great way to learn about our ocean creatures ." However, one user said: "If humans hadn't thrown chips, the seagull wont try to catch it and the octopus would continue to eat fish. Humans, breaking all the natural laws...."